Where will you holiday this year? BBC's lavish, visually exciting and suspenseful production of John Le Carre's The Night Manager featured some equally dramatic locations, including here on our very own Hartland Peninsula. In Episode 2, the 'Cornish' hideaway in which Jonathan Pine, played by the enigmatic Tom Hiddleston, sets up the identity that will earn the trust of Richard Roper, played by a magnificently menacing Hugh Laurie, is actually right here on the Hartland Peninsula. Blackpool Mill Cottage, part of the Hartland Abbey estate owned by Sir Hugh and Lady Angela Stucley, is no stranger to filming. 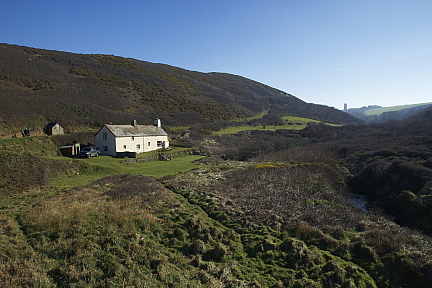 It was the location for Barton Cottage in the BBC's lavish 2008 production of Sense & Sensibility, and before that in Rosamund Pilcher's The Shell Seekers. Despite it's decidedly 'rustic' presentation as Pine's bolt-hole, it's actually a wonderful 15th Century holiday cottage, complete with all mod cons whilst also being the ultimate, get-away-from-it-all destination. It sleeps 8, is set in its own secluded valley right beside the sea and can be rented all year long, with prices ranging from £725 per week right up to £1600 in the middle of the high season, though you may be able to get reduced prices for just 2 people sharing or snap up a bargain for a short break out of season. Hartland Quay with its hotel, Shipwreck Museum and bar and superb cliff scenery, Hartland point and lighthouse, Hartland Abbey and Gardens, St. Nectan’s Church and Docton Mill Gardens are all within walking distance; Clovelly, Welcombe and Morwenstow are nearby. Hartland with its excellent Post Office, Old Bakery Coffee Shop, Pop-In general store, artists, woodworkers and pottery studios is 2 miles away. Find all the details about Blackpool Mill Cottage here: www.hartlandabbey.com/blackpool-mill. And of course, if this isn't quite the right holiday accommodation for you, choose from glamping pods, cottages, cliffside chalets, converted barns with hot tubs, town houses, campsites and even backpacker's hostels, all wholly within this stunning Area of Outstanding Natural Beauty. See this page for all the holiday accommodation, inns, hotels & campsites on the beautiful Hartland Peninsula. If you want to read about all the other locations featured in The Night Manager, see this Radio Times article.